It is with heavy hearts the family of Kerry announces her passing on Thursday, December 6, 2012 at the age of 41 years after a long battle with cancer. 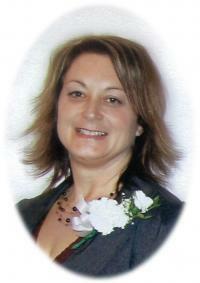 She will be forever loved and remembered by her husband Darren; daughter Briannagh; son, Hunter; parents Bill and Marie; two brothers; Bill and Kevin; mother and father- in- law; Nancy and Fred; brothers- in- law; Steven and Rick; sisters- in- law; Teri Lynne and Julie; extended family and many friends. The family expresses a heart felt thanks to all of the Doctors and Nurses at the Cross Cancer Hospital, Lamont Hospital, massage therapist Shawna Moore for your caring and healing. A special thanks to the Grey Nuns Palliative ward unit #43, Dr. Sarah Butler Macleod, and Dr. Amanda Brisebois, and their entire staff for their tender and compassionate care. A Funeral Service will be held at 11:00 a.m. on Thursday, December 13, 2012 at Foster and McGarvey Funeral Home located at Connelly-McKinley Sherwood Park-Mill Woods Funeral Home, 4820 Meridian Street, Edmonton. (Meridian Street can only be accessed heading SOUTH on Hwy 216/Hwy 14 (Anthony Henday) the access is 1 km south of the Sherwood Park Freeway on Hwy 216).